For lovers of what is often considered an exotic delicacy, it is the juicy pockets of fat that make the duck tongue so prized. 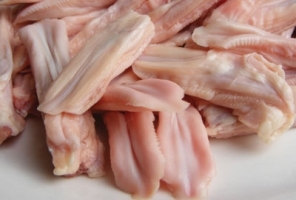 At approximately two inches in length, the tongue is small, yet its taste is intensely duck-like. When freshly fried, duck tongues are positively addicting with a crisp surface and a creamy, slightly fatty interior that melts in your mouth. Like potato chips or pork cracklings, one tongue is never enough. Packed to order in poly.